It seems that companies succeeding the most at content marketing and inbound marketing are none other than content marketing and inbound marketing agencies - organizations wired to do those things extremely well. Well, agencies or tech-savvy businesses like SaaS (software-as-a-service) companies or other tech-related businesses. Could short-handed marketing departments with non-technical products really 'do' a labor-intensive activity like inbound marketing as well as, or even better than some agencies? Plus, while inbound marketing is all the rage in the US, it hasn't completly caught on yet in places like Canada. Which is why we see very few Canadian inbound marketing agencies to begin with. So does this process really work for non-technical businesses? 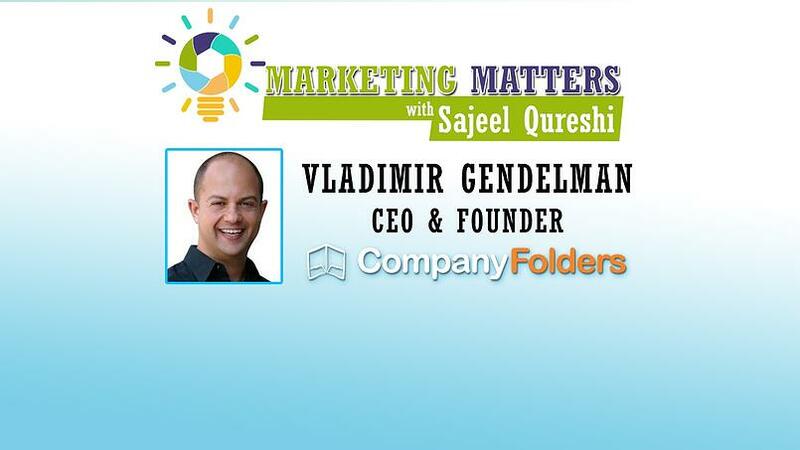 Vladimir Gendelman, the founder and CEO of Company Folders is living proof that this is possible. Company Folders is the standard bearer in online folder printing and arguably the market leader when it comes to designing and printing presentation folders. In this episode Vladimir breaks down in very simple terms the way Company Folders' relatively small marketing team packs a huge punch with inbound marketing and content marketing tactics. - Produce amazing content that is far better than anyone else in your industry. - Invest time and effort into your content. Vladimir's team is incredibly thorough and their blog posts are as thorough and detail-oriented as their presentation folders are (their production is off the charts). Vladimir's team spends close to 100 hours per post including the design of images, writing, editing and overall management. Vladimir says the amount of time is irrelevant - maybe some people can do great work in less/more time. The bottom line is, again, to do great work. - Know your audience - Company Folders found out very quickly that their audience wasn't necessarily people 'buying' the product at businesses like purchasing managers, but rather it was graphic designers. As such, they make sure to gear all content to their target market and nobody else. This helps weed out irrelevant traffic to their online properties. - Social Media Isn't For Everyone - Vladimir was quite candid in Company Folders' approach to social media. They focus heavily on Facebook and image-based platforms, but not so much on platforms where they don't see a lot of engagement. Every business will be different, but in there case they found maintaing a Twitter account to be relatively useless. - Pay to play - Vladimir acknowledged that while his content is extremely helpful and gets better with every post there is a massive amount of noise on the web. Therefore, Company Folders does pay traffic markets like Facebook to promote their content for them to the appropriate target markets (graphic designers in North America). This serves as the inertia to get his content seen. Then, he lets the audience like/share/comment as they deem fit, but since they put so much effort into their posts it's more likely to happen then not.